Some coffee experts would have consumers believe that it’s impossible to buy an espresso machine for a couple of hundred bucks, but we’re here to say that just isn’t the case. Although the expensive models do come with a few more features, there’s no reason why the coffee drinker can’t find a budget espresso machine that does exactly what it’s supposed to do and makes a great cup of espresso. All a person has to do to find an inexpensive espresso machine is to do a little bit of research. And thanks to this article, a person even doesn’t have to do that much. That’s because we’ve come up with the ten best espresso machines under $500. Anyone of the following machines can make the perfect cup of espresso and is a great addition to any kitchen. Although this espresso machine doesn’t take up a whole lot of counter space and is only 10.8-inches by 7.6-inches, it’s still capable of producing a great tasting espresso. It uses the Nespresso capsule system that makes it very convenient for the person to create the coffee drinks they want to create without having to follow a coffee recipe. The capsules are easy to use, although they do tend to be a bit expensive. This machine also has a pressure pump that delivers 19-bars of pressure, just enough to draw full flavor into each cup. And since it has an integrated carafe, it can automatically dispense the correct amount of milk into each creamy and delicious cup. If you’re looking to make European quality espresso but want to do it on the cheap, then you will probably want to take a look at this machine. Not only is it in the under $500 range, but it’s even below $100. And yet, it’s capable of producing a cup of rich espresso that will make some people wonder why they’re spending so much money at a coffee shop. This machine heats up quickly, is easy to operate and it has a small footprint, so it can fit on most counters. Although it tends to be a bit loud when it’s being used, it’s not so loud that it makes it impossible to use. Overall, it’s a simple machine with a 2-cup capacity that’s able to make great cups of short or long espresso. Using 19-bars of pressure, this barista-grade espresso machine is ready to pull a perfect cup of espresso. This machine is equipped with 3 milk and 2 coffee options, so the user can also get the right coffee drink whenever they use it. This machine also heats up quickly and is always ready to deliver the perfect espresso quickly. Although the water container on this machine could’ve been a bit bigger, it’s otherwise a great machine that does its job well. And it’s built-in milk frother is sure to be a delight to anyone who likes a nice foam on their espresso. All of which makes it a decent espresso machine for any home. 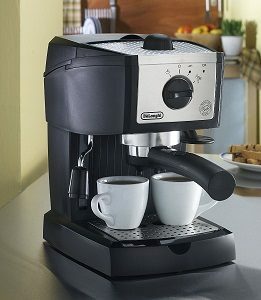 This espresso machine is ready to deliver a European quality espresso that’s sure to impress friends and family. It has an Italian made 15-bar pump that slowly builds up its pressure so that the machine can create the perfect environment for extracting out the essence of the coffee. This machine allows the operator to manually control the shot volume of the espresso made and can be used to make one to two espressos at a time. It has a steam wand that’s ideal for steaming and frothing milk, and it also has a water tank with a 61-ounce capacity, so it doesn’t have to be constantly refilled. This stylish looking espresso machine not only has a modern design but it also has many of the features that people look for in an espresso maker. It has a 1600-Watt thermo-coil heating system that accurately heats water up to the proper temperature for brewing. It also has a 15-bar Italian-made pump that provides the operator with volume control over their espressos. This machine is also equipped with an espresso gauge which shows the point in the brewing process that the machine is at and it has controls for making one to two cups of espresso. Although it’s water tank is a little small, this machine is still capable of producing some fine tasting espresso. This machine doesn’t take up a lot of space and has a sleek design that allows it to fit into any kitchen’s decor. It features a powerful 19-bar high-pressure pump that allows for proper extraction of the pods and results in a full-flavor espresso that just about anyone can appreciate. This machine is very energy-efficient and automatically turns off after 9-minutes, so it won’t run up the electric bill. It’s also a machine that’s pretty easy to use and only requires filling it up with water and inserting a capsule. This unit has a 24-ounce water tank, a folding drip tray and can accommodate large single-serve cups. Now anyone looking for a great tasting espresso or cappuccino can have one in their home thanks to this innovative machine. It has a 1-button easy-to-use interface that makes it easy to operate. Although it doesn’t have an add water light on it as similar espresso machines have, it isn’t that hard to keep an eye on its water reservoir to make sure it has enough water for extraction. This machine also has an automatic milk frother, a removable milk reservoir that’s easy to clean and has a pump that provides up to 19-bars of pressure. And it even has an adjustable cup tray that can accommodate either short or tall mugs. Although this espresso machine may look like similar inexpensive models on the market, it’s actually a fully-functional espresso maker that makes great single-serve espresso or coffee each time it’s used. Although it’s milk frother can be hard to clean, most of the features on this machine are intuitive and easy to use. It features a 19-bar pump system that’s capable of extracting the perfect coffee from each Nespresso coffee capsule. This machine’s milk frother really puts the finishing touch on lattes and cappuccinos, so the coffee lover can enjoy coffee house quality drinks in their home anytime they want. Not only does this machine have beautiful styling that makes it a great looking addition to any kitchen, but it also has some great features. This machine is capable of producing single-serve coffee and espressos easily and without a whole lot of user intervention. It also has an integrated milk frother that makes it even easier for the user to create great tasting drinks. Additional features that can be found on this machine include a TFT LCD display, a 1.5-liter removable water tank, an auto-purge steam wand, a pump that delivers 19-bars of pressure, and a stainless steel milk jug. This bundle set is designed for espresso lovers who want to take full control of their espresso making process. It comes with a stainless steel tamper, an additional brewing head and a custom-fitted carrying case that holds everything together. This machine allows for precise tamping of coffee grounds, and since it’s hand-pressed, this machine is capable of producing the perfect amount of coffee extraction. Although some people may not like the idea that this is a manual machine and not an automatic one, it can be said that this device does do an excellent job of making a perfect espresso. When people buy expensive espresso machines, what they’re usually paying for is convenience. Although we won’t argue with the fact that some of the top espresso models are built according to quality standards and may be worth the extra cost in terms of durability, sometimes all a person wants is an espresso machine that makes great espresso without costing a small fortune. With that goal in mind, we’re going to talk about some of the features a person should look for when choosing a new espresso machine. How Easy Is The Espresso Machine To Operate? The first thing the espresso lover should consider is the ease of use. That’s because some of the best espresso machines in the budget range are manual models—which tends to be harder to use than an automated model. On the other hand, if convenience is absolutely necessary, then there are still a few automated models in the under $500 price range for consumers to consider, so it shouldn’t be too difficult to find one that fits your needs. In fact, you’ll find several in the above list of espresso machines. Do You Need A Built-In Grinder? Unfortunately, most of the espresso machines in the price range don’t come with an integrated coffee bean grinder, although there are a few of them that do. This shouldn’t be too big a deal, however, because coffee bean grinders are fairly inexpensive, so the espresso fan should be able to pick one up to go along with their new espresso machine. Do You Need A Built-In Milk Frother? Just because you’re buying a low-cost espresso machine doesn’t mean that you have to give up having a machine with a built-in milk frother. There are several models in this price range which have milk frothing units built into them, including several on our above list. What Coffee Drinks Do You Need To Be Able To Prepare? 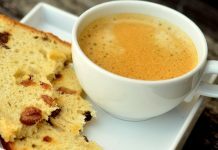 When shopping for a budget espresso machine, it’s important to think about the drinks that you want to be able to prepare. It’s important to think about it because not everyone is going to need an espresso machine that can make a large variety of drinks. If you don’t need to make an espresso macchiato, cappuccino, cafe latte, an Americano or a cafe mocha, then you probably aren’t going to need a machine with advanced features. In fact, depending on what you need, you may not even need a fully functioning espresso machine. Although it may be sacrilegious to some coffee aficionados to talk about, some people may only need an espresso machine that uses capsules. After all, these machines are easy to operate, make a cup of espresso quickly and the espresso they make is decent. Sure, it’s not going to be as good as an espresso that you make by grinding the beans and using a full-feature espresso machine, but sometimes people have to balance perfection with convenience. If you do decide not to go with an espresso machine that uses capsules or pods, then you’ll probably want to get a machine that has a good pressure pump. A machine that provides 19 to 20-bars of pressure is good enough for most machines to achieve maximum extraction out of the coffee and is more likely to make barista-quality coffees. The final thing to think about is the size of the espresso machines. Machines in this price range can be as space-saving as a small drip coffee maker or big enough to take up a good-sized counter. That’s why it’s important for the espresso drinker to consider the space they have for their machine and be sure to buy one that has the features they need, all while fitting in the space available for it.